HES Gdynia Bulk Terminal (former MTMG) is located at the main entrance of one of the biggest Ports of Poland, the Port of Gdynia. With its direct rail and road connections the terminal is an all-round terminal with services such as reloading of dry bulk cargo as well as the direct transshipment of liquid bulk. 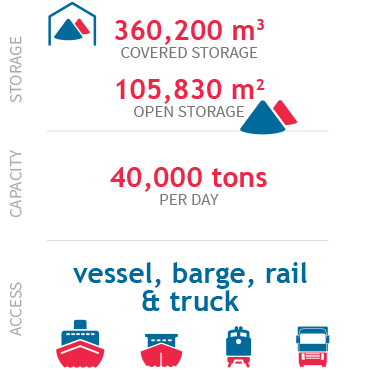 HES Gdynia Bulk Terminal offers open and covered storage facilities. The excellent water, rail and road connections combined with the outstanding transhipment and storage capabilities enable HES Gdynia Bulk terminal to meet today’s customer demands, as well as the challenges of the future. In the business of extensive dry bulk supply, HES Gdynia Bulk terminal is alert to the potential environmental impact of the activities. That is exactly why they implement special measures to reduce dust. Stockpiles and open areas are covered with a protective layer as a precautionary measure. The terminal is ISO, OHSAS and GMP+ certified. We operate as a universal terminal. Rendering 24/7 services of reloading and storing of bulk commodities such as agribulk (grains and feedstuffs), coal and coke, aggregates, fertilizers and also liquid cargoes (including chemicals of the 3rd, 6th, 8th and 9th classes according to the IMDG Code), crude oil and its derivatives. We are located at the main entrance of the Port of Gdynia and are directly connected to the hinterland through its railway and road networks. HES Gdynia Bulk Terminal (former MTMG) also renders operational and technical services for Liquid Fuels Reloading Post located at the breakwater of the Port. This reloading post serves tankers with diesel for import. We can serve tankers with a length upto 210 m and a draught up to 11m. HES Gdynia Bulk Terminal is specialized in the handling of dry bulk. They offer open and covered storage capacity for dry bulk commodities as well as general cargo. A total covered storage capacity of over 350,000 cbm is available for a diversity of dry bulk commodities such as minerals, biomass etc. A 220,000 cbm warehouse with loading and unloading technology is located on the Silesian Quay, and especially designed for storage of agricultural products. The warehouse has four loading stations, each equipped with an electronic weighing system. It is connected through bridge conveyors system with a 54,000 cbm warehouse situated on Swedish Quay allowing a flexible surface disposal. Additionally on the Danish Quay there is a 3 detached flat warehouses with a capacity of some 50,000 cbm, and a 20,000 cbm warehouse at the Dutch Quay. HES Gdynia Bulk Terminal is not only investing in covered storage capacity but is also expanding its open air area, offering clients separated paved stockyards with direct connection to quays and rail. Effective health, safety and environmental protection systems management is the key to the success of our business. Prevention of accidents and incidents is one of our core values. We believe that we can avoid them and we are determined to achieve this goal. We have introduced stringent standards and procedures for health and safety management which are constantly checked to be sure that our expectations are understood and respected by every employee and contractor acting in our terminal. By caring for nature, employees and customers’ requirements, HES Gdynia Bulk Terminal is dedicated to maintaining the certificates on environment, safety, health, quality and security. HES Gdynia Bulk Terminal is ISO 9001, 22000 and OHSAS 18001 certified. Furthermore we are HACCP and GMP+ FC certified. Just as with environment the safety is also an everyday team game. Caring for nature while considering our employees’ and customers’ requirements, HES Gdynia Bulk Terminal is constantly alert to the potential environmental issues of our activities. Dust is a specific challenge when it comes to dry bulk handling. HES Gdynia Bulk Terminal invests in modern systems of protecting heaps against excessive dusting by covering commodities with a thin layer of cellulose using Dustcrusterliquid® installation. Health and Safety procedure outside handling or renovation zones on HES Gdynia areas and buildings. Health and Safety procedure in handling or renovation zones on HES Gdynia areas and buildings. A list of energy companies ordering handling services via HES Gdynia.